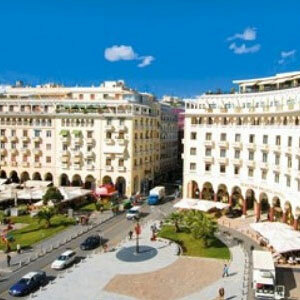 Is a church dedicated to Virgin Mary and its name is translated “not made by human hand”. 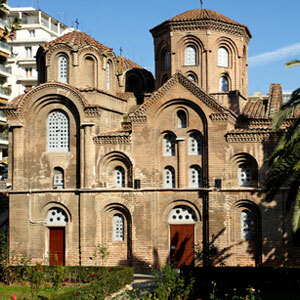 The basilica mentioned in written sources as the church of the Virgin Mary’s and even as the great church of the Virgin Mary. The Acheiropoiitos name first appeared in a document of 1320 and it was related to the holly image of the Virgin. The church was built over the ruins of a Roman bath during the fifth century. The Acheiropoiitos name first appeared in a document of 1320 and it was related to the holly image of the Virgin. 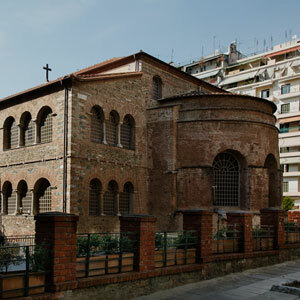 This church was the first which was converted into a mosque during the year of 1430, when the Ottomans invaded and conquered Thessaloniki. The frescoes and mosaics of the church were destroyed almost completely. From the rich sculptural decoration stands out the Ionic capitals which came directly from the 5th century’s laboratories of Constantinople. Today, visitors can observe some parts of frescoes which still exist and they are dated from the 13th century and parts of the mosaics which have survived and are dated from the 5th century.